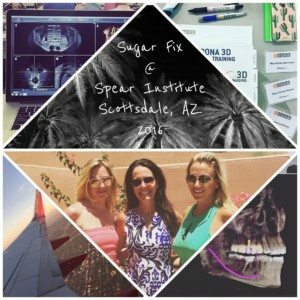 This week Dr. Emery and 2 members of her team headed out west to do a “Sugar Fix Scottsdale” takeover! Actually, we were there for training on our new Sirona CBCT scan equipment! It was definitely a hot one in the desert with a high of 117 degrees on our first day!! We found relief by the pool after our courses! We had two days at the Spear Institute learning about how 3D technology of our new scanner is going to help us out tremendously for when we place implants and also in detecting any abnormal pathology. The first day was mostly a refresher course for normal and abnormal pathology of the sinuses, bone, and glands. For Dr. Emery reading the scan and being able to detect any abnormalities will really help our patients in detecting issues early-on before they become bigger issues. The 3D scan lets you view all the teeth and lower 2/3 of the full jaw! We get to see all of the anatomy at every angle. This is mind blowing compared to the 2D images! Our new CBCT scan is awesome! On the second day we learned how the 3D scanner integrates with implant technology which then in turn integrates with our Cerec unit! 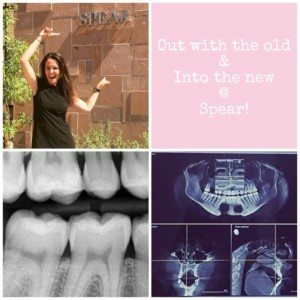 It is such an amazing way to do implants. Instead of the old fashioned guessing game of where the implant was going to be placed and hoping it is okay, we can now see every millimeter of the implant as well as every direction of the implant to make sure it is placed perfectly. The cerec unit mills out a placement guide. After the implant is placed, the unit can also make the abutment and crown that go with it. In the past, we would have sent the case to the lab; this eliminates the down-time of waiting for the lab for the implant parts! This is a MASSIVE benefit to our patients and we are so happy to have this new technology in-house for all of you now! After classes were done, we had some amazing dinners with the Sirona team as well as our own team time to discuss the courses and our next moves at The Loft! Overall, it was definitely one of our favorite courses and we are super excited to move forward with our new awesome technology! The Sugar Squad in Scottsdale!